With tropical palm-laden beaches, stunning mountain trekking and a vibrant cultural scene it is no surprise to see Cape Verde leaping forward in the list of winter sun hotspots. Sprawled off the west coast of Africa and a relatively short flight time from the UK, the nine islands with a growing a reputation as the ‘African Caribbean’ are the ideal getaway. Some parts offer a beach paradise with soft white sandy shores that really do rival any ‘paradise’ island. Others will give you a taste of adventure surrounded by natural wonderment and a few will even let you live like a local. Travel with the island’s catchphrase ‘No Stress’ in mind and you won’t be disappointed wherever you go – but to fully appreciate the mixture of unique charms the archipelago offers we recommend opting for an island hopping adventure. We began our trip with a visit to São Vicente, a 40-minute internal flight from Sal. This was the cultural hub of our three main stops, set impressively amongst a striking, extinct volcanic landscape. 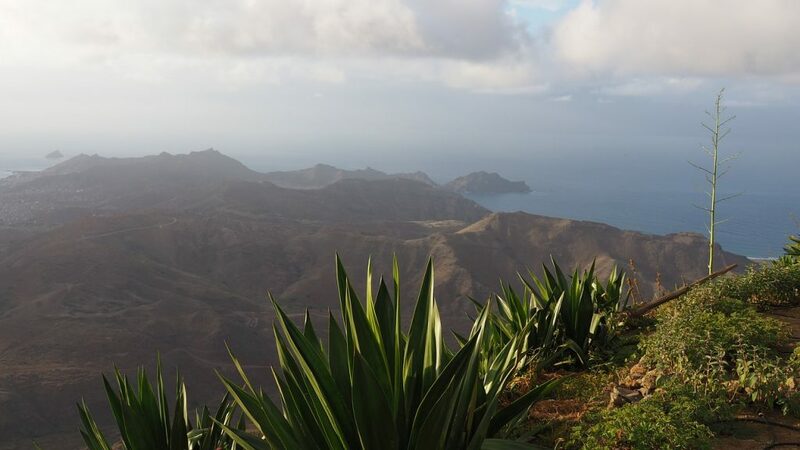 To get your bearings upon arrival take a trip – either by car or by foot – to Monte Verde, the “green mountain” for a stunning 750m high 360 degree view of the entire island. But it is the town of Mindelo where the vast majority of the population lives, that is the beating heart of the island and we were fortunate enough to see preparations for February’s carnival in full swing. Anyone lucky enough to time their visit can expect a colourful spectacular that has united the community and thrilled the crowds for decades. Out of every bar, restaurant and cafe belted traditional music with several bustling markets brimming with strong aromas of fresh fish, meat, vegetables and spices, while impromptu street performers brought a lively atmosphere to even the most casual of strolls. São Vicente is a place to immerse yourself in your surroundings and be swept along by the feel-good vibes. Most of the African art produced by Cape Verdeans is created here and a visit to the local museum gives you the opportunity to visit several exhibitions, which bring to life the island’s fascinating mix of colonial style and African tradition, alongside it’s proud musical heritage. The late Cesaria Evora was Sao Vicente’s most famous resident, Grammy-nominated and famed for her vocal style, she is immortalised across the island and her popularity is encapsulated at the museum. From Mindelo’s main town beach you could see on the horizon our next island – Santo Antão – but it was not until you disembarked from the hour long ferry that you are fully able to appreciate how naturally stunning it was. The panoramic transfer from the ferry port to our hotel on the other side of the island took us through the vast mountain ranges on a 37km road cut through the expanse with every winding turn offering another must-see photo op. It was one of the most dramatic and picturesque drives I had ever witnessed and gave a taste of the hiking that lay in store for us. Our base was the Hotel Tiduca, a quaint spot overlooking the landing site for the village’s many fisherman. The next morning we were up early with our passionate and knowledgeable local guide Odair Gomes leading the way as we departed on foot from the middle of the volcano. With a short steep climb to reach 1,300m followed by a lengthy decline down the mountain, we weaved our way past all manner of tropical plants, fruits and coffee beans, and got a taste of the simple yet happy life for the communities living there. There are varying hikes for all abilities, but for hiking novices like us, despite feeling a little sore afterwards, it was an experience not to be missed. Our senses were left in awe of the fresh eucalyptus filling the mountain air and the array of natural herbs growing on the hill sides, which locals use to treat all their alignments, shunning modern medicine. We were particularly surprised to see no less than two types of mango tree growing there. The third and final island on our week-long whistle-top tour was Sal which proved the perfect destination to relax aching limbs from the rocky mountainous trek in the calm clear ocean waters. Sunbathing was very much the order of the day on the white sandy beaches with cocktails in hand. The island, which has a flatter, more desert-like landscape, also featured several points of interest for anyone able to drag themselves away from the lounger. The Pedra Lume Salt Crater is worth a visit and you can take a dip and float in the salt water that legend says will slow down the ageing process. There is also the unique chance to go for a paddle at Sharks Bay, which is an experience not to be missed. A short wade out and you will find several lemon sharks starting to circulate your feet. We were promised they were harmless and all our tour left in one piece. Most of the hotels are based within the tourist town of Santa Maria with scores of bars and restaurants is a lively place to spend the evening. Our only complaint – a week was just not long enough. Temperatures in the late 20s was such a welcome therapy that it was a shock to return to what felt like a deep freeze. Our first visit to Cape Verde will certainly not be our last. Specialist tour operator Cape Verde Experience offers a 7-night Barlavento Trio island hopping holiday visiting Sal, São Vicente and Santo Antão from £1379pp, based on two travelling. Includes international and internal flights, all transfers plus a panoramic transfer tour, 20kg luggage, tourist visas, UK airport lounge access and 7 nights’ accommodation with breakfast. Tailor-made island hopping itineraries also available. Capeverde.co.uk, 01489 866969.